Can a one touch overclock button make up for a lack of features on this 990FX motherboard? The big difference between this 990FXA-GD80 and MSI's much cheaper 970A-GD45 (besides the befuddling array of characters) is the chipset. The 990FX chipset will let you play with multiple graphics cards, whether they're Nvidia or AMD-flavoured. So if you're one of those rare slobbering maniacs with two Nvidia graphics cards and a penchant for AMD processors, this board will allow you to play out your sick SLI fantasy. Does that justify double the expense of the 970A-GD45? Certainly not – let's hope there's more on offer than just versatile GPU support and a lightening of the wallet. At £135 it's looking quite an expensive proposition. 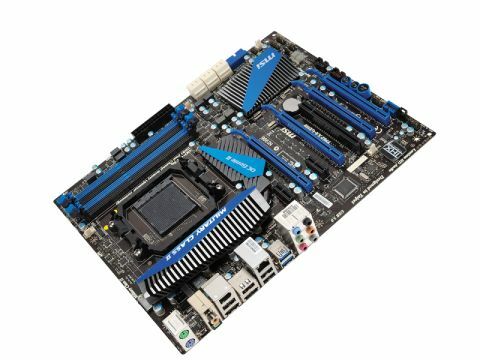 It does little more than right the wrongs of cheaper boards – ASRock's Fatal1ty 990FX Professional and the Asus Crosshair V Formula shower extra features on the ever grateful user. So, whatcha got, MSI? Okay, well it does have the OC Genie. The 248 per cent performance boost it promises is complete rubbish of course, but it's a hassle-free way to overclock and a great starting point for further tweaking. You can take a bit more control over overclocking in this BIOS of course, and even change exactly how that OC Genie button works when you press it – how far it ramps up the FSB, or CPU clock ratio, let's say. The big issue though is the price. At £100-odd we could understand its feature set compared to the competition. At £135, said competition is just too close in price and too good – this board's capable, but out-classed by its rivals.